Last weekend, we celebrated our founding at the annual Leatherneck Ball in New York City, where we heard from one of our inspiring Marine Scholars, Amanda Beckett. Amanda learned the value of hard work and dedication from her father, veteran Marine LCpl Michael Beckett, an infantry machine gunner who served in Vietnam. With the help of the Marine Corps Scholarship Foundation, she graduated debt free from Lehman College in 2015, and today, she’s making a name for herself in the competitive media and communications industry. 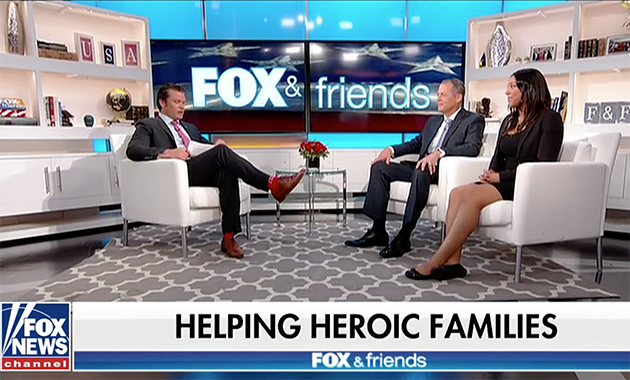 On Sunday, alongside Scholarship Foundation President and CEO, LtGen Robert Ruark, Amanda discussed her father’s service and what our scholarship support means to her with Fox & Friends. Amanda’s story reminds us of what the Marine Corps Scholarship Foundation is all about: honoring our Marines by lending a hand to their children, one by one. Our work began with just a single student like Amanda. The very first Leatherneck Ball was organized 56 years ago by a small group of service-minded Marines who stepped up to help a World War II Medal of Honor recipient send his child to college. Since that first Leatherneck Ball in 1962, we’ve helped more than 40,000 scholars like Amanda achieve their dreams by providing over $120 million in scholarship support with the help of supporters like you. From our founding to today, we have worked to uphold the vision our founders set forth at the first Leatherneck Ball: to ensure no son or daughter of a Marine is left behind. As we celebrate our organization’s anniversary, we continue to be committed to providing scholarship support to every single eligible student who applies. Click here to watch the video of Amanda, and learn more about why scholarship support means so much to Marines and their families.